Our defining characteristics of a fast food restaurant are: there is no tipping, you serve yourself or stand in line to order and pay, the food is available or can be assembled quickly, there is a place to sit and eat the food, and the price range is low to moderate. For those on a budget, one important features is no tipping, which saves you about 15% right from the start. The low to moderate price range is also important. Hamburger chains come to mind when thinking of fast food. McDonald's and Dairy Queen are the only ones you will find in Banff. Other chains are Domino's Pizza and Subway. But other places meet our definition, including some surprises, like the Castle Pantry in the Fairmont Banff Springs Hotel. 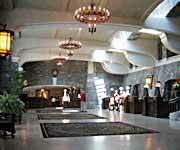 Through an archway at the North side of the majestic lobby of the Fairmont Banff Springs Hotel is the Castle Pantry. The Pantry caters to the needs of the hotel visitors and guests interested in some quick refreshments or that want to put together a picnic basket, from gourmet to economical. Sit on a chair at the archway counter and look through the arch into the beautiful Fairmont Banff Springs Lobby and watch the activity as you drink your coffee or eat your meal. With prices starting at $2.50 (2006) for a self-assembled peanut butter and jelly sandwich and no tipping, this meets our definition of a fast-food restaurant. Prices were higher in 2008, but we both ate well for about $5 each. 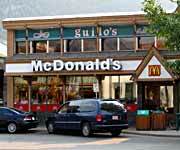 McDonald's seem to be everywhere and Banff is no exception. It is located in the center of town on Banff Ave and you can sit at the counter-top facing the window and people-watch while you have your favorite items. Ours is an Egg McMuffin for breakfast with a senior coffee. Subway has two locations in Banff. One in the Cascade Mall Food Court and the other one just a half block down the back alley from the Internet cafe where we surf. 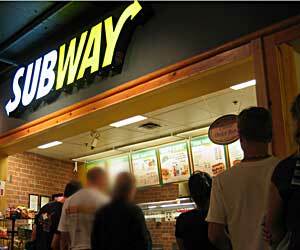 A convenient place between Internet sessions to share a foot-long sub made the way you like it. When we want to picnic, we often pick up a subway here and walk or drive over the bridge to the Cascade Rock Gardens in Canada Place to picnic amongst the flowers and mountain views. Banff has a variety of ethnic fast food restaurants including Italian (mostly pizza places), Japanese, Greek, and Chinese. Walk the streets and discover the many ethnic restaurants in Banff. Most list the prices on menus posted at the restaurant entrance. Many meet our definition of fast food restaurant. If you loosen the criteria for a place to sit, then you can include the many mini-markets at gas stations and other places in the fast food category. They often have sandwiches and sometimes hot food you can pick up or microwave. Some of them have a table outside where you can eat your food and if not, you can almost always find a nearby place to sit and eat.